"There is no greater story than ours, that of man and woman. It will be a story of giants...invisible...transferable. A story of new ancestors." 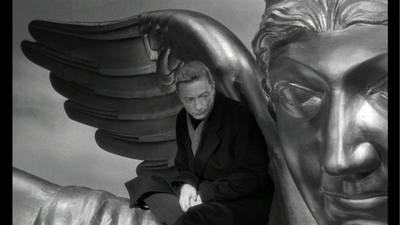 I still remember seeing Wings of Desire the first time. I had heard about it from watching Siskel & Ebert, and knew vaguely that it was the same filmmaker who was responsible for Until the End of the World, which I had not seen either, but I obsessively listened to the soundtrack, which I had purchased for the new Depeche Mode track. Just as that CD had introduced me to a bunch of bands I didn't really know, expanding my musical horizons (Elvis Costello covering the Kinks was like a double-shot of "What's this good stuff? 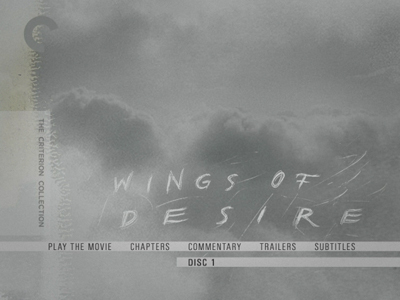 "), Wings of Desire would be important to my understanding of experimental narratives and cinema as art. If nothing else, it made foreign films that didn't have samurais in them a little less scary. 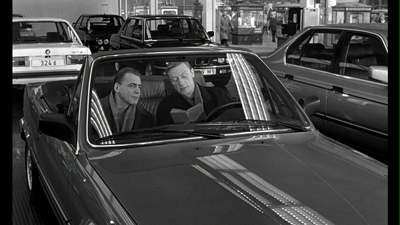 Released in 1987, Wings of Desire is the brainchild of German writer/director Wim Wenders. The filmmaker was at the zenith of his creative powers in this period, with Wings being in the middle of his three best fictional films, sandwiched between Paris, Texas and the aforementioned Until the End of the World. (Seriously, when the hell are we going to get a DVD of that?!) That's some esteemed company, but even amidst those films, Wings of Desire is still the best, the uppermost tip of Wenders' artistic spear. That's because Wings of Desire is the film that could not be made by anyone else, that could not be made at any other time. This was two years prior to the fall of the Berlin Wall, and I think that fact alone would have changed the tenor of Wenders' masterpiece. Though there is very little mention of the political situation in Berlin at the time, the separation that city felt was very much a part of the subtext. Wings of Desire is about a world divided, about the line between the spiritual and the physical, the fanciful and the practical. Between the poetry of words and thought and the true poetry of life. 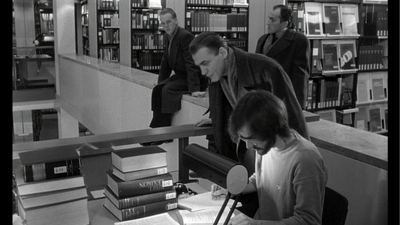 Bruno Ganz stars as Damiel, one of an army of angels assigned to Berlin. In this reality, angels act not as guardians, but as witnesses. They wander through our lives, silent and invisible, observing our activities and eavesdropping on our thoughts. They might follow one person in specific, or they might roam through a crowd, sampling a little something from each. There are wonderful scenes on a plane or in the public library where the sound mixers scroll through the gathered people, moving from one inner monologue to another the way we flip through channels with our TV remote. In the library, there are almost as many angels as there are mortals, all looking for something interesting to commit to memory or maybe scribble down in one of their little notebooks. Damiel shares just such discoveries with his best friend Cassiel (Otto Sander). After centuries of observing the human race, they are still capable of being charmed by our irrational behavior. Just reporting that he saw a woman close her umbrella and allow herself to be drenched in a downpour brings a smile to Damiel's face. What unpredictable creatures! What must they feel? How do things taste? What's it like to really hold something in your hand? The angels can take objects from us, but they are merely copies and not tangible. It's not the same. Call it divine existentialism. Our earthly version of that philosophy ponders what it must be like to transcend the physical and join the divine; for an angel, the crisis of identity involves shedding your wings and eternity and becoming flesh. Damiel has grown tired of watching, he wants to start doing things. 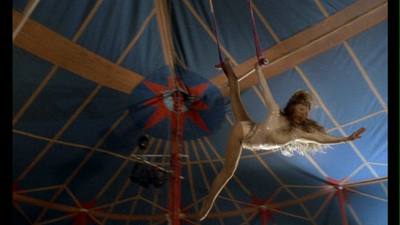 The final catalyst for "taking the plunge," the human idiom for what is essentially a fall from grace, is a beautiful trapeze artist, Marion (Solveig Dommartin), that the angel has become smitten with. She is his human analogue, soaring above the ground as she does, even wearing a pair of feathery wings. Marion dreams of flying, Damiel dreams of walking--opposites, prepare to attract! The romance is sort of the cherry on top, and the rest of the movie is the true sundae. It's the build-up, the gathering together and the exploration of this world. Wenders takes us on a tour through the city, showing us people from all walks of life. Under his gaze, living is a lyrical happening. One of Cassiel's favorite people, an old poet named Homer (Curt Bois, who had acted in his first movie eighty years before Wings), asks why no epic ballads have ever been written in tribute to peace the way they have been about war. This would seem to be a personal challenge that Wenders has made to himself and buried within the movie proper. What Cassiel and Damiel observe is like a visual song celebrating an everyday peace. It's not all happy--there is suicide, bills to pay, drug addiction--but there is a nobility to forging ahead, to making your own personal story even if no author is ever going to write it down. It's easy for the angels, they pass through everything unharmed; humans have the ability to touch and be touched in turn. 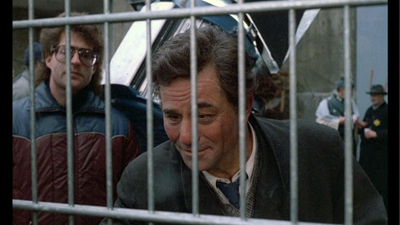 Divinity has its purpose, but as Peter Falk, playing himself as a former angel, informs Damiel, there is nothing to compare to the sensations of the finite. Falk's role also connects the film to history. He's come to Berlin to make a movie about a private detective in WWII, and extras stand around on the set wearing Nazi uniforms and clothes marked with the Star of David. The past is alive and well within the city, and old newsreel footage is cut into Wings of Desire, seen from car windows, the ghost of memory. It's another division between realms, one of many in the movie. Wim Wenders and cinematographer Henri Alekan (Topkapi), along with assistant director Claire Denis, create a vivid visual division between the heavenly and the earthly. The angels and what they see are shot in crisp, cool black-and-white (restored here to a more silvery hue rather than the gold of previous DVDs) while the mortal experience is shown to us in full color, rich in tone and often garish. Humanity experiences the full spectrum, whereas the angels' vision is limited. For all of their peeping in on our brains, the angels are confined. They can't do anything else. This is the core of existentialism: choice is what makes us free. Our imperfections define us. The brightest light burns half as long. 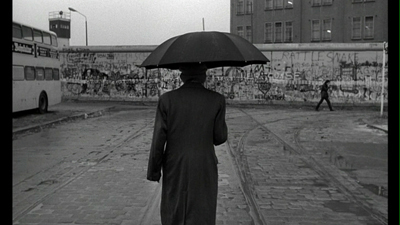 For all these happenings, Wings of Desire actually ends on a downbeat. Though Damiel has found love and joy with Marion, Cassiel is now alone in the heavenly realm, watching his friend's new life without anyone to talk about it with. His divine plight is one of loneliness, but as the final words of Homer and the "to be continued" card that precedes the credits tell us, this is only the beginning of the story. Like an acorn falling from a tree, Damiel is only the first. The sequel, Faraway, So Close! , was several years off, and I don't recall it having the same impact. Maybe it was best to leave well enough alone. Somehow the suggestion that maybe Cassiel will follow Damiel's example is more effective than him actually doing so. It's probably because it allows us all to be Cassiel, looking to a more hopeful future all our own. The follow-up story itself ends up being too specific, and thus not satisfying. I don't recall movies from the same period being nearly as hopeful as Wings of Desire. Not without resorting to treacle. Wim Wenders manages to avoid the schmaltz. Wings of Desire is the work of an artist who can see a better world on the horizon and is using his art to reach out for it, to pull it closer. His message remains in the abstract, but it's no less effective for not being spelled out. That angelic power of observance, the god's eye view afforded by the camera, equalizes all life in our vision, let's us find ourselves within it, and forever changes how we see things in the process. Or at least that's how it was for me. How about you?